Spring Greetings to all So Cal Flame Surfers! Hope you all are enjoying the beautiful, though unpredictable, weather. May has been a very special month for SCFS. 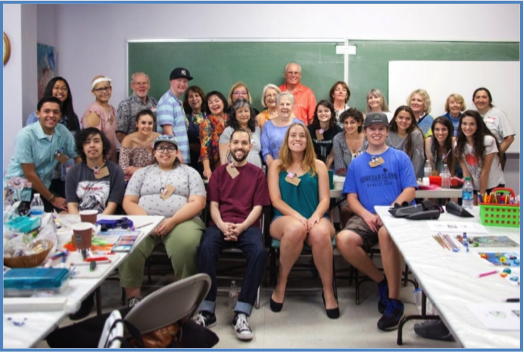 We hosted about 20 young adult Beads of Courage members from Children’s Hospital of Orange County (CHOC) for an open studio at Orange County Fine Arts’ Showcase Gallery. We set up several torches and our members made beads that were designed by the BOC members. 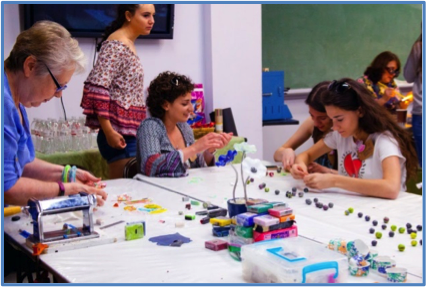 We also got everyone involved in making polymer clay beads; many thanks to Kathy Spignese for coordinating this activity. We also had the privilege of working with polymer clay artist Corliss Rose from 2-Roses Studio, who kept us supplied with polymer canes, design sheets, and inspiration. Wendy Leys got a wonderful surprise when she noticed that one of the BOC members had a caterpillar bead that she made! 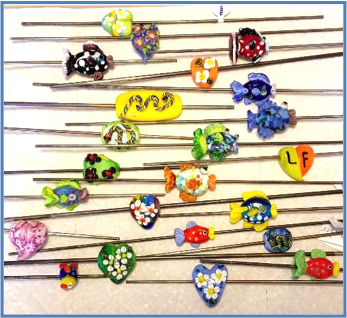 We made over 20 special glass beads and over 100 clay beads during the event for donation to BOC. Plus, CHOC provided us with a delicious breakfast and lunch. We’re already making plans to have another event next year and hope you can join us. See below for more photos from the event. Our next event is our regular meeting on June 9, at Pacific Art Glass in Gardena. We will have all the regular fun activities at the meeting, including raffle, gift exchange, show and tell, and lots of opportunity to catch up with friends and colleagues. Our feature event at the meeting will be a demo by fellow Flame Surfer Susan Haskell. 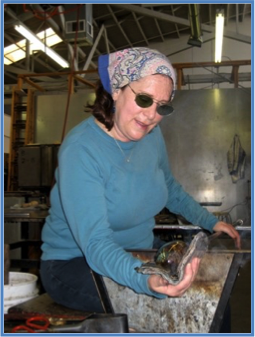 Susan will show how she has adapted glass blowing methods to make off-mandrel vessels on the torch. And don’t forget to bring in your BOC donations. We had a great year for donations last year, and we are counting on you to keep providing support and inspiration to BOC members. See below for more information on the June 9 meeting. Thanks to John Williams and the staff at PAG for hosting our June 9 meeting and supporting SCFS events. We will provide drinks and snacks during the meeting. You are welcome to join us for lunch after the meeting. If you haven’t renewed for 2018 yet, please remember to bring money to pay your annual SCFS membership dues so you can participate in all our 2018 activities. Demo. Flame Surfer Susan Haskell will show us how she creates blown vessels at the torch. Susan Haskell is a glass artist and painter born and raised in Los Angeles. She studied at UCLA where she received a B.A. in Pictorial Arts and a M.A. in Design. She also earned teaching credentials from Pepperdine University and is currently a teaching assistant at Santa Monica College in the Glass Blowing Department. 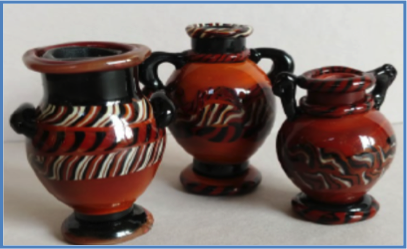 Sus an’s love of glass led her to explore a variety of creative methods including, glass-blowing, torch working and fusing. Her paintings have included large scale outdoor murals (Los Liones Canyon) and a twenty-year series of photo-realistic paintings of tunnels (The Tunnel Vision Series). Susan’s greatest pleasure has come from nearly thirty years of teaching elementary school art to children at Canyon Charter Elementary School in Santa Monica Canyon. Beads of Courage Donation. Please keep the donations coming. Help us meet our goal of donating 2,000 beads this year. All types of beads are appreciated and used by BOC. Courage beads, those with a special theme, size, texture, or sculptural element are especially needed. Courage beads are given to document significant events in a child’s treatment. There are never enough courage beads to satisfy the need, so they must be rationed out to the hospitals. 100,000 courage beads are needed every year! 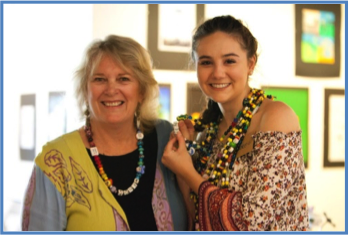 Perhaps one of your beads will give support to a local BOC member and you will see it at our next BOC open studio. 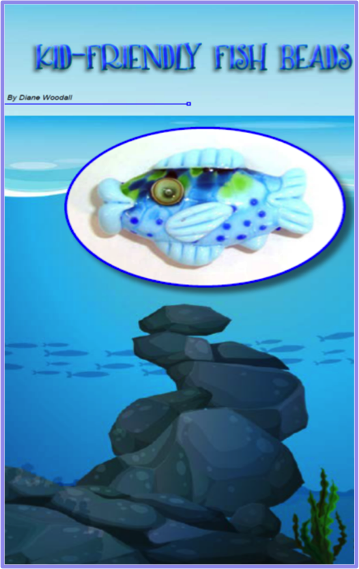 This month’s tutorial suggestion is the fish bead from Diane Woodall’s latest collection of tutorials: Hot Glass for Cool Kids Volume 3. 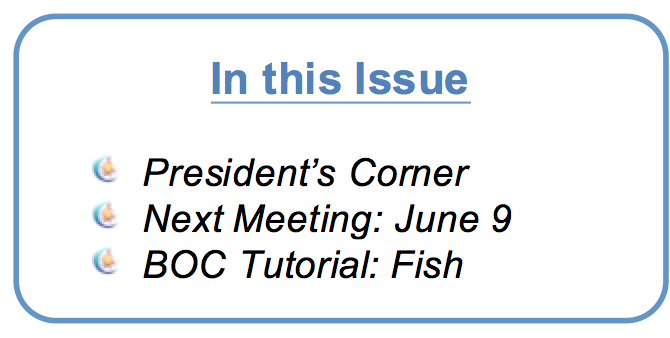 This fish bead was the most popular of the three styles we made during our open studio event, so you can be sure they will bring a smile to many other BOC members. As you can see from the open studio bead photo above, there are lots of ways to vary these beads to make them unique and with personality. Get the tutorial here.